In continuation to the CarBlogIndia Technology Articles , today I will talk of one of the most talked about safety feature called the ABS And EBD. Again I will try to keep the language simple and human understandable (which non-engineers can also make some sense of), pun intended. Anti-Lock braking System system or ABS is a safety system which prevents the wheels on a moving vehicle from locking up(or cease while rotating) while braking. ABS offers improved vehicle control over dry and especially slippery surfaces by reducing the braking distance but it can also increase the braking distance in case of loose surfaces like snow, gravel etc. Ever since the invention of ABS, it has been evolving and the recent systems not only prevent wheel locking but also electronically control the front-to-rear brake bias, which we know as Electronic brake force system, Traction control system, Emergency brake assist or Electronic stability control. When brakes are applied under heavy loads, the braking pressure becomes high resulting in heavy braking or in other words locking up of wheels. The ABS overcomes this by monitoring the wheel speed and releases pressure on each wheel brake lines in the form of rapid pulses switching between different brake lines. which prevent locking-up. Preventing lock-up under heavy braking helps the driver in maintaining control over the vehicle. In modern ABS an individual brake line is provided for each of the four wheel enabling different braking pressures for different road surfaces of the wheels. Electronic brake- force distribution system also called as Electronic brake-force limitation is an automobile brake technology that automatically varies the amount of force applied to each of a vehicle’s brakes, based on road conditions, speed, loading, etc. EBD system is always coupled with anti-lock brake-force system. The most important function of EBD is to maintain vehicular control with variation in braking pressure applied to each wheel in order to maximize stopping power. Generally most of the weight of all vehicles is carried by the front end so the EBD ensures less braking pressure at the rear end to avoid skidding. But in some EBD’s the distribution of braking pressure at the rear end is more initially when the brakes are applied before the effects of weight transfer comes into play. 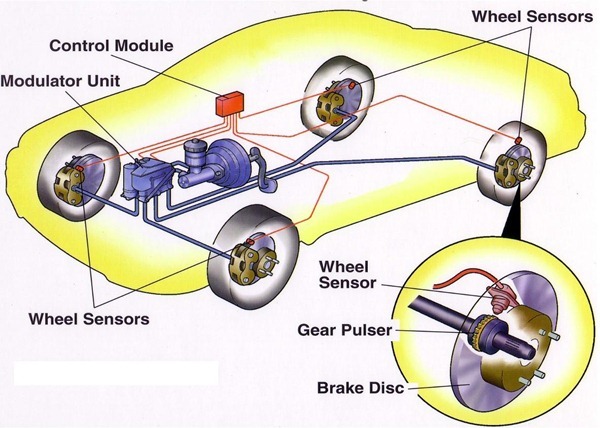 An EBD is a subsystem of the abs and its function is to control the effective adhesion utilization by the rear wheels. this definition has been given by SAE in its technical paper no. #920646. The Antilock brake force system releases pressure in different brake lines at the time of heavy braking to prevent locking-up. The action comes in the form of releasing pressure from the braking circuit when it detects extreme and rapid deceleration in any of the four wheels in order to make sure that the driver maintains control over the steering during panic or emergency braking. For example if the wheels of a vehicle are on snow as well as asphalt then in case of emergency braking the ABS will monitor the speeds and eventually the EBD system will release less pressure for wheels on snow and more pressure for wheels on asphalt to prevent wheel lock-up.